The JUMP JAM programme provides students with a valuable exercise habit early in life along with skills and attitudes to meet their ongoing health and physical activity needs. It also allows for development of a wide range of movement skills which can help students to understand the ‘science’ of how they move. By enjoying and understanding the health and physical exercise benefits of aerobics, students eventually become future role models by leading fellow students through the routines and later instructing their communities.Cultural movement concepts from NZ and other societies are included; e.g. Haka, Polynesian, Latin, Indian, South African, Spanish and even martial arts fitness. Cardiovascular fitness is interwoven with dance, drama and music to allow a creative self-expression for the students as they explore and identify a variety of dance styles. Students also relate with each other within the group dynamic, sometimes working as one unit, other times performing separate masculine and feminine cultural movement patterns. We believe the following Key Competencies can be included in a teacher’s planning with the use of JUMP JAM resources. 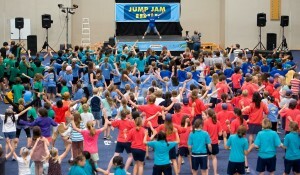 Whether for individual students as a leader of JUMP JAM or as a team for a competition or for a demonstration etc. If your school does not yet hold a JUMP JAM licence, please contact us on orders@kidzaerobix.com and we will email you an order form and pricing for our JUMP JAM start up kit.